I was thrilled when I discovered this recipe at Food 52; it really is just like the “country bread” that I love so much in England. It is dense, and substantial. It’s unbelievably quick to make and bake (no kneading or second rising — just a 45 minute rise, then into the oven). Add boiling water to cold milk in a large bowl. Place the dough into a greased loaf pan. Cover with a clean towel and allow to rise in a warm place for 45 minutes. 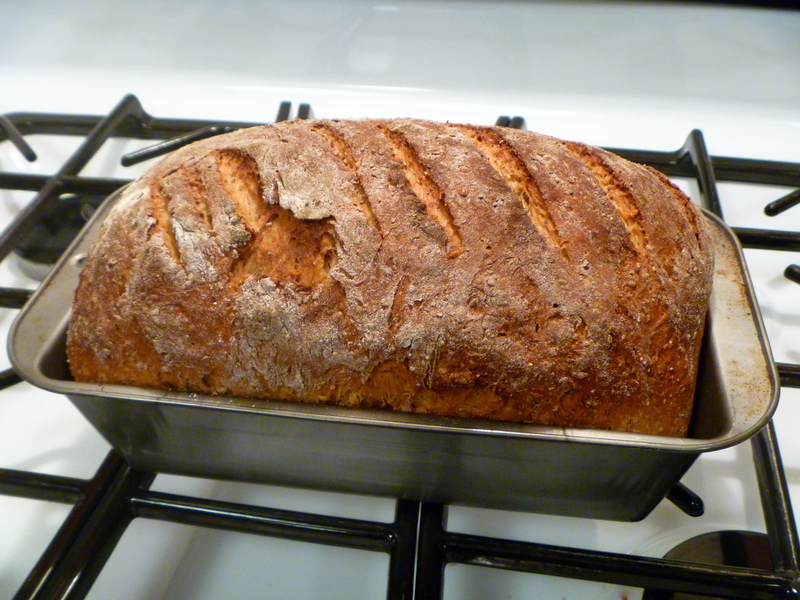 Bake, uncovered, for 25 minutes (I consistently need to bake the bread for 8 additional minutes). For original recipe, including the story behind it, go to Food 52 . Liz Schmitt, aka “Liz the Chef’s” blog is here. The finished results of my Mom's recipe for banana bread. 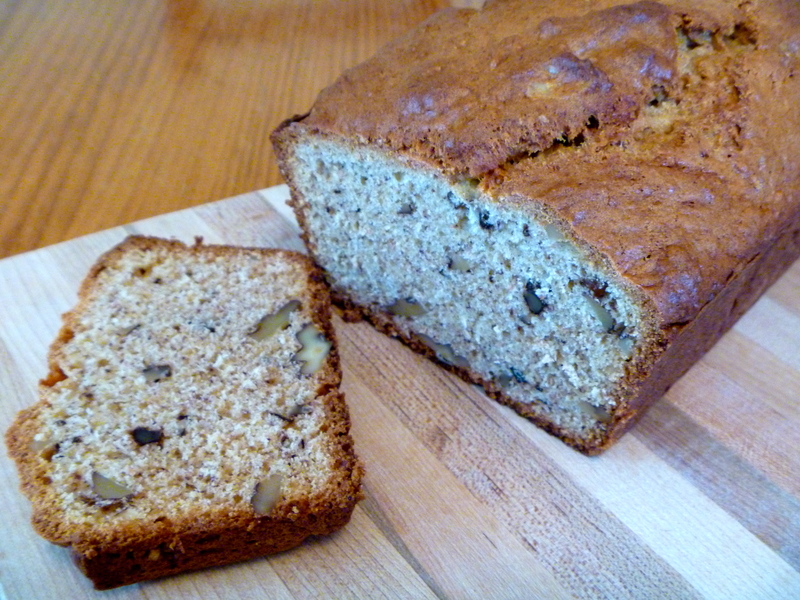 I do love my whole-wheat-nutrition-packed recipe for banana bread, but sometimes I just crave my Mom’s! Mix dry ingredients together with whisk. In a separate bowl, cream butter; add sugar gradually until light and fluffy. Add eggs and beat well. Stir in nuts and rind. Add flour alternately with the mashed bananas. Do not over mix. Bake in a greased 8”x4”x3” loaf pan, at 350F for 55 minutes, or until done (toothpick inserted into middle comes out clean). Store for at least 6 hours before cutting/serving, preferably overnight. Add ingredients to the machine in order listed. 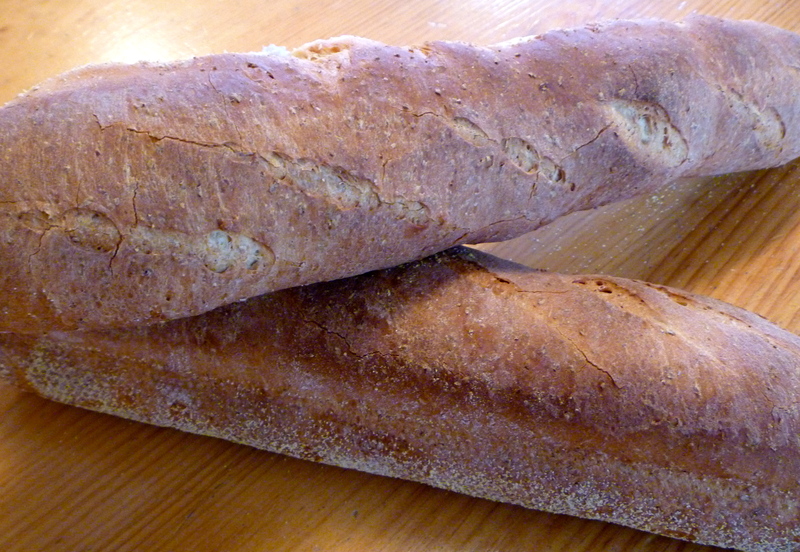 Use 1 ½ lb whole wheat setting if using machine for entire process. Select “Dough” to shape it by hand and bake it in your oven. When dough is finished, remove it from the pan onto a floured surface (about 1 to 2 Tbsp of flour). For freeform loaves, shape the dough into a smooth ball by pulling it down the sides and pinching underneath. Let it relax for a couple of minutes, then shape it into 1 or 2 rounds or 1 or 2 oblongs, and place on a lightly greased or parchment-lined baking sheet. Cover with a damp tea towel, and let rise in a warm, draft-free place until almost doubled in bulk. Bake at 400F for about 30 minutes, until it sounds hollow when you tap on the bottom. Add ingredients to bread machine according to the manufacturer’s directions. Select the whole wheat cycle, or the dough cycle. Bake at 400F for about 30 minutes. Combine the flakes, and spread out in a shallow pan. Toast in a 350F oven for 30 minutes, stirring once or twice. Keep sealed in a container, or freeze until needed. I double or triple the recipe so I have lots on hand. Lightly sweetened, and very dense. Soak apricots in the boiling water for 10 minutes, set aside, and cool. In a separate bowl, beat together the sugar and butter until fluffy. Into the sugar-butter mixture, add the egg, and the almond extract. Beat well. Stir in the apricots and the water they’ve been soaking in. Stir well to combine. Pour the wet ingredients into the flour mixture, adding almonds at the same time, and stir gently. Do not over mix! Smooth into a greased loaf pan, and bake for about 50 minutes at 350F. NOTE: this batter is extremely thick and does not “pour”, so don’t be alarmed when you are mixing it!